Every time it feels like I have my children pegged, they turn round an surprise me. I know they don’t do this to be contrary, but their little quirks often leave me bemused. Allow me to enlighten you all further. Ophelia, like most two year old girls, loves pink – it is her favourite colour. No one else in the house is allowed to have that colour as their favourite. I have been told that my favourite colour in no uncertain terms is purple! (This is fine by me, but have I created a little bossy monster?!) She lives for the days when she can wear as many mismatched items of pink clothing and display them to as many people as possible. She is also the little girl who refuses to be left out by her brothers and insists on joining in with their superhero games and who received a Hulk costume for Christmas so she isn’t left out. She also loves glitter and all things that sparkle. Unicorns it seems fall into this category. She has unicorn toys, a back pack and a lunchbox. 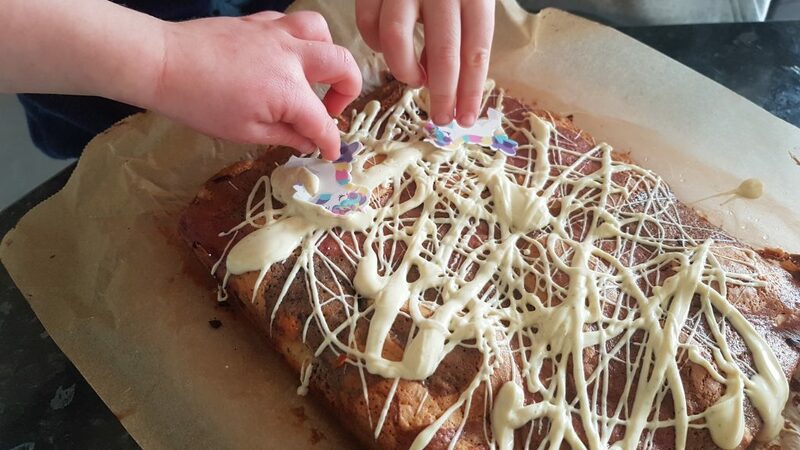 So with this bake for World Unicorn Day on the 9 April (yes this is a thing, I was unaware until a post on Instagram informed me of the fact) I thought I would be making these with just her, but the boys also eagerly insisted on joining in – an unexpected, yet welcome surprise (this proves you should never – even subconsciously – try to categorise your children…). The success of this bake should be measured by the fact that I have had to hide them from everyone so that they don’t gobble them up without me noticing. Because I am clearly the only one who can be trusted with leftover cake in this house… My only motive is to ensure that everyone gets their fair share and so I can take a secret blondie tithe! Beautiful colours in the blondie. 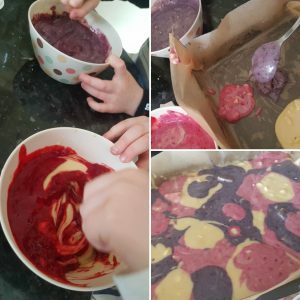 To make the different colours, we used frozen blueberries and raspberries instead of food dyes. They don’t produce as vibrant a colour as food dyes do, but they do add a really nice fruity taste to them. 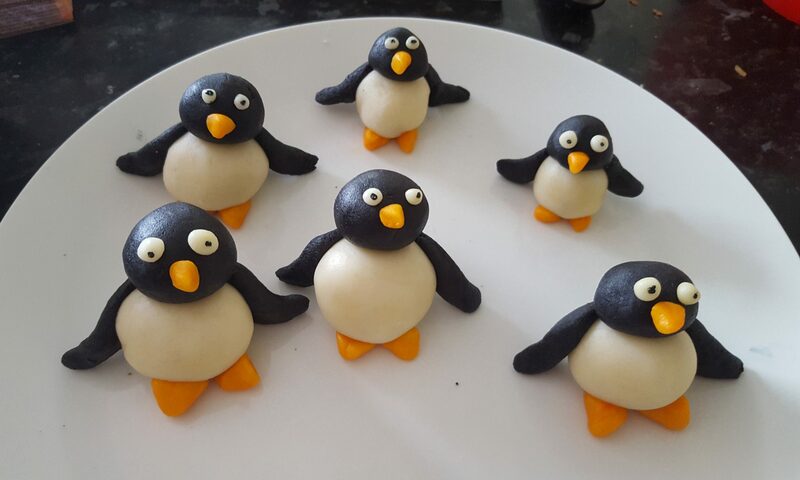 They also make me think that they are slightly healthier despite all the chocolate! Colouring the blondie, dolloping it into the tin and the pretty pattern it created. Remove the blueberries and raspberries from the freezer and allow to defrost a little. I placed mine on defrost in the microwave for 20 seconds each. Preheat the oven to 170°c fan and grease and line a brownie pan. While still in the packets, bash the chocolate with the end of a rolling pin to make small pieces. Place 100g of the chocolate pieces into a heatproof bowl with the butter and put in a double boiler until all melted. Allow to cool a bit. Put the sugar and eggs in another bowl and whisk together until smooth and completely combined. Gradually add the chocolate mixture to the egg mixture and beat together. Sift in the flour and the baking powder and fold together. Add another 200g of the bashed chocolate and mix so all the bits are evenly distributed. Divide the mixture between 3 small bowls as evenly as you can. Using a stick blender, zap the blueberries and raspberries (in their separate containers) until they are smooth. Put the blitzed raspberries into one of the blondie bowls and the blueberries into one of the other bowl and mix to combine. 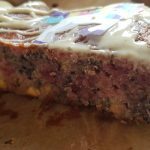 With three separate spoons, dollop alternate blobs of the three mixtures into the brownie pan creating a pretty pattern as you go. Place in the oven for 25-30 minutes until cooked. Remove from the oven and allow to cool in the pan for a while. 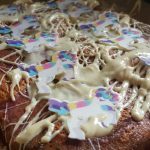 Melt the final 100g of white chocolate and drizzle all over the blondies (we used a teaspoon to do this) and decorate with copious amounts of rainbow or unicorn sprinkles or even edible unicorn wafers like we did. Adding the finishing touches to make them worthy of the unicorns. 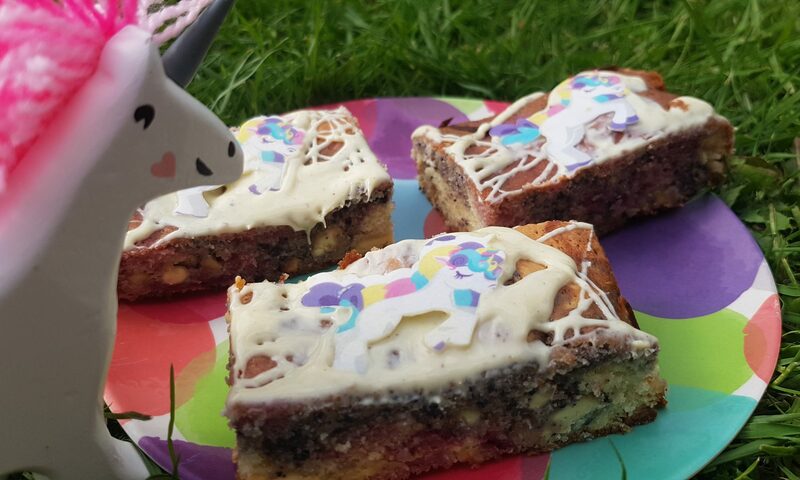 I hope you have a sparkly and colourful World Unicorn day filled with rainbows and other beautiful things, but most importantly these Unicorn Blondies. 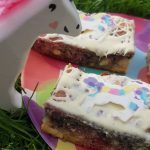 Today is 9 April, and I am happy to report that we have three small squares of blondie left for the kids today. That is good planning and restraint on my part! To have fruit instead of colourings-great. Thanks. I am so glad to hear this Gilly! I hope your chocolate-free lent hasn’t been too challenging.